NAMEN is honored to announce the third in a series of web conferences towards building a Community of Practice. "Holding our Ground, What to expect in the new US Administration?" We will conduct a dialog on: What impact do we expect on our work, is there a benefit hidden in the obvious costs? US President Donald Trump is the ultimate hegemonic patriarch, where vulgar locker room talk is celebrated, men grabbing women without permission is sport and being a bully is proud tradition. 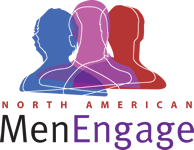 What does this mean for our work engaging men and boys for healthy masculinity?